(19687.TO.A083.08.1.24, Chester R. Cowen Collection, OHS). The southern Caddo County town of Apache is situated twenty-three miles north of Lawton at the intersection of U.S. Highway 62/281 and State Highway 19. Before the opening of the Kiowa, Comanche, and Apache Reservation on August 1, 1901, the present Apache townsite had been reserved at the recommendation of land lottery director William A. Richards. He wanted the village to be named for him, and early arrivals expected to settle in the community of "Richards." Through a twist of events Chicago, Rock Island and Pacific Railway officials gave the town of Apache its name. The change caught everyone off guard, including the publisher of the town's first newspaper. He printed several issues of the Richards Review before the Apache designation was confirmed. Town lots in Apache were obtained on August 6, 1901, by a "run," similar to the one that had occurred at Chandler in the Sac and Fox opening of 1891. Therefore, Apache holds the distinction of having Oklahoma's last land run. From the start, entrepreneurs were ready for trade. Five lumberyards and six saloons began within hours. Groceries were sold from a tent. The National Bank was established, and in fewer than three months the Apache State Bank was in operation. The first eight-room, brick schoolhouse in Caddo County was erected at Apache in 1902. Apache's first officials were elected on the evening of August 6, 1901, in a meeting on the corner of Summit and Evans streets. E. E. Blake was selected as mayor, and F. E. Richey was chosen city clerk. Other appointees included I. F. Crow, city attorney, and Sam Wass, city marshal. On July 22, 1902, Apache was incorporated. Apache is, and has always been, an agricultural center. Wheat and cattle are the community's primary economic base. The town is the home of the Fort Sill Apache tribal headquarters, whose members have been artist Allan Houser and cultural leader Mildred Cleghorn. The town's population has fluctuated from a low of 919 in 1920 to higher figures of 1,302 in 1930, 1,455 in 1960, and 1,560 in 1980. It peaked at 1,616 in 2000 but declined to 1,444 in 2010. Along with rodeos, annual events include April's Apache Rattlesnake Festival and the Apache District Fair in August. 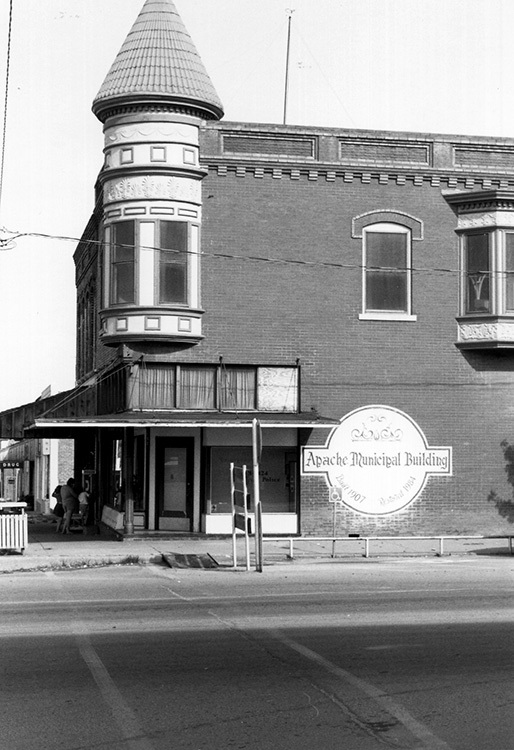 Local properties listed in the National Register of Historic Places are the Amphlett Brothers Drug and Jewelry Store (NR 82003669) and the Apache State Bank (NR 72001060). "Apache," Vertical File, Research Division, Oklahoma Historical Society, Oklahoma City. George Levite, By George! For Lilly (Norman, Okla.: Levite of Apache, 1974). Roy B. Young, "Apache," The Encyclopedia of Oklahoma History and Culture, https://www.okhistory.org/publications/enc/entry.php?entry=AP001.